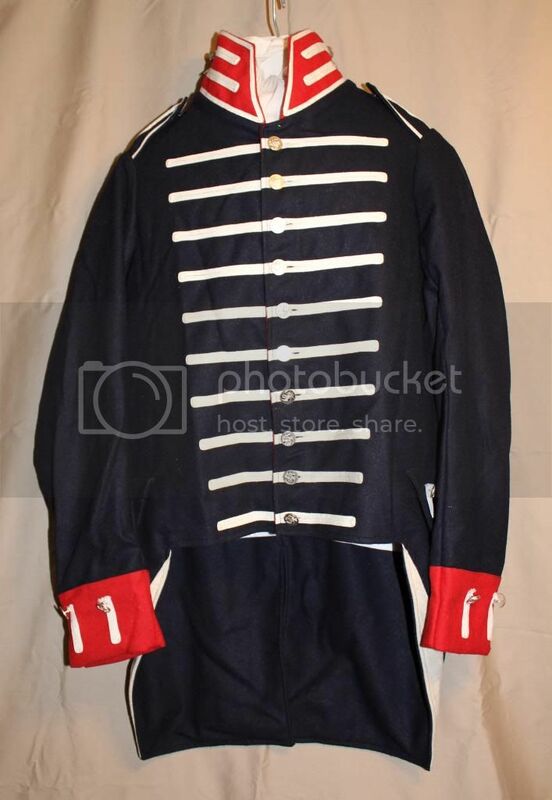 As worn during the the War of 1812, the Red Stick War, etc. 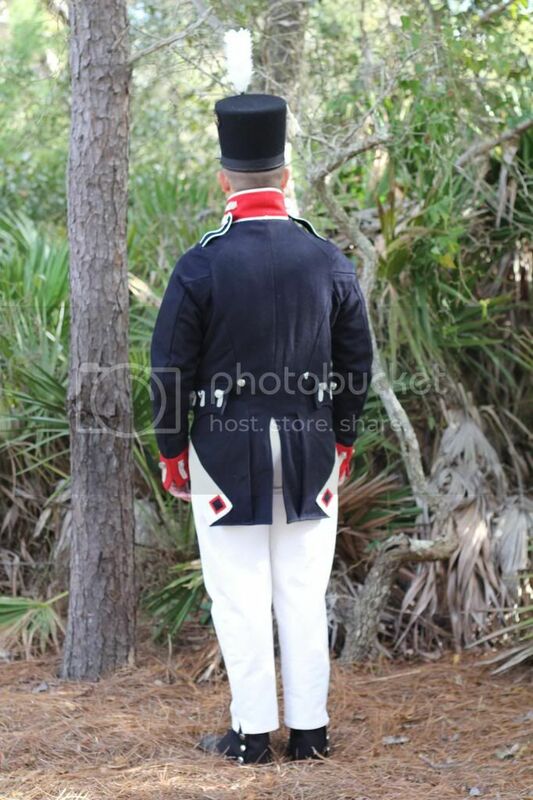 In 1812, the US Army adopted new uniforms. Infantry enlisted men were to wear a dark blue coatee, with red collar and cuffs, white turn backs, and having ten rows of white lace on the front. 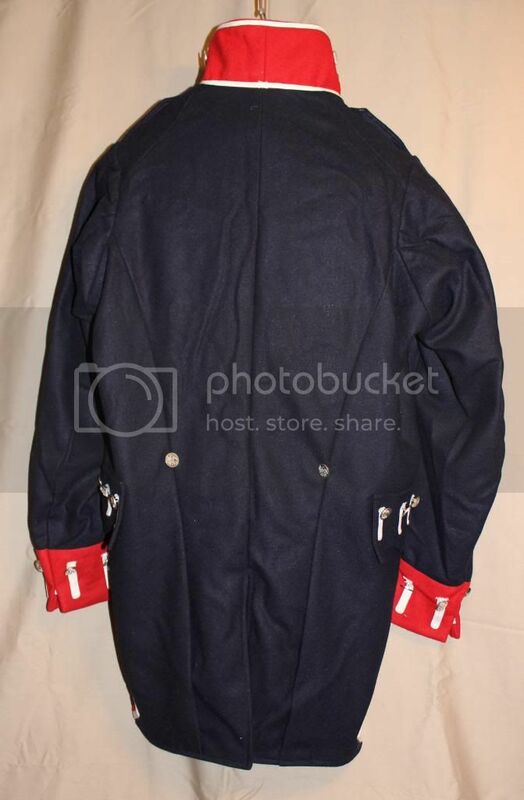 The front was to have a button closure (as opposed to the hook and eyes used on the 1810 Pattern coatees.) Likewise, the collar, cuffs, and pockets were trimmed in white lace. 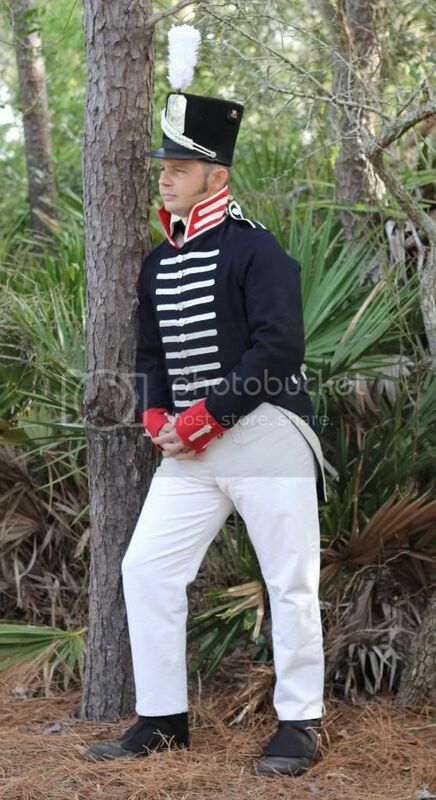 In addition to US Regulars, many militia units also drew Federal uniforms and would have been partially or completely attired in 1812 Pattern dress. 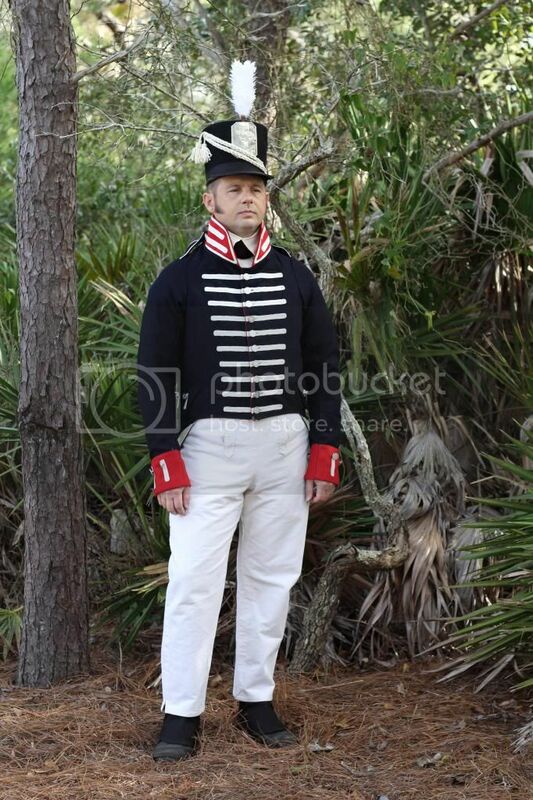 In early 1813, the army decided that new uniforms on the 1812 Pattern should be made absent the white lace except for the collar. Also, some units began to be issued coatees without the lace attached so that they could install it in a fashion in compliance with the latest regulations or at the discretion of their officers. For this reason, there appear to have been some discrepancies in the amount of trim applied to the coatees late in their production. 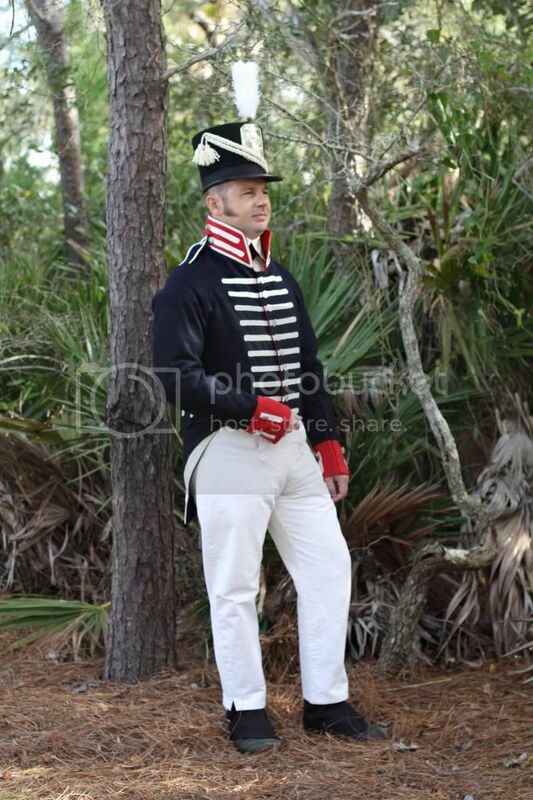 Our reproduction 1812 Coatee is true to the original in form and appearance. The body is made of high quality blue and red wool with a wool and cotton lining. The trim is correct white, worsted wool lace. The pewter buttons are the eagle over oval style. It has a period cut with high waist, tall collar, and long sleeves. 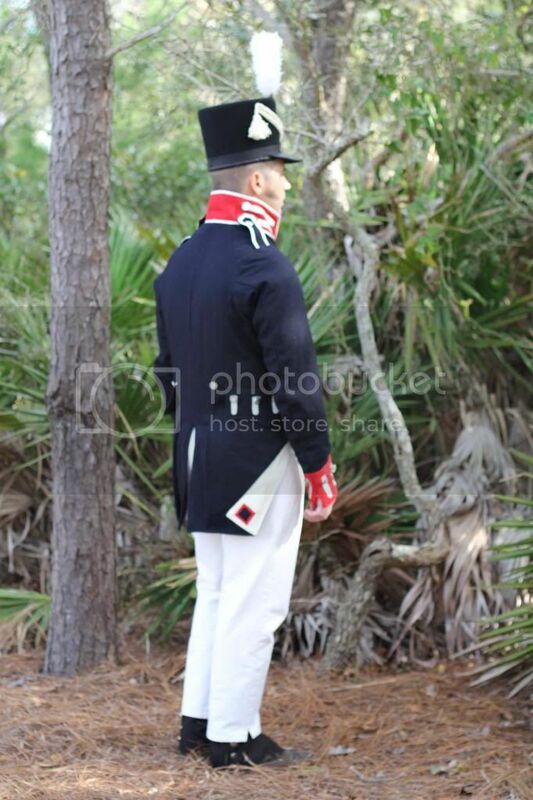 Our 1812 Coatee also comes fully trimmed. Taping can be removed by the customer should a late-issue look be desired. 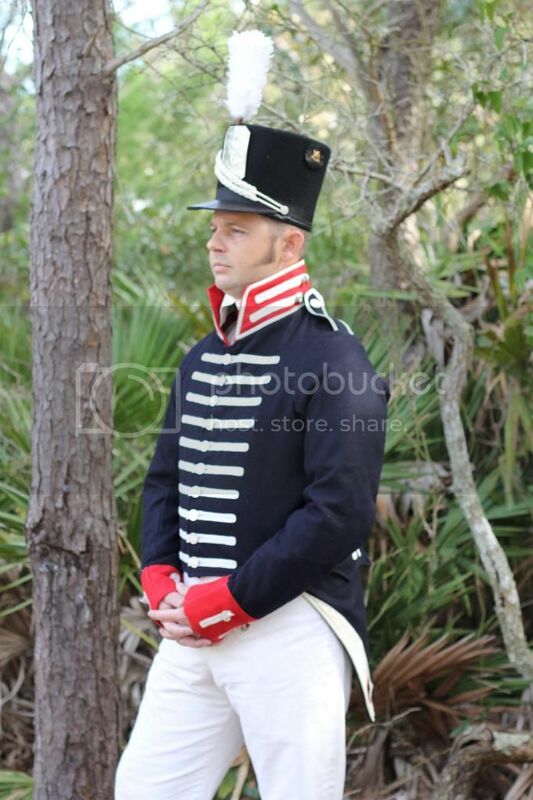 Additionally, our 1812 Infantry Coatee also provides an excellent foundation for the creation of other War of 1812 period uniforms. It can be easily altered to create an authentic Officers, Artillery, or Light Artillery coatee by swapping out the white cording for another color/style. It would also be possible to reproduce a number of different militia uniforms by altering the coatee's trim, adding cut-aways, taping, etc. As was the fashion of the period, all of our coatees are meant to be somewhat tighter fitting than modern apparel. We typically recommend that one select a coatee which is one (1) size larger than the wearer's normal coat size. (Ex: If one normally wears a size 40 sport coat or jacket, then we recommend purchasing a size 42.) However, if you wish to forward us your measurements, we will select the correct size for you. If you are uncertain of your size: Measure with a tape around the chest underneath the arms, with the arms hanging at your side. Take this measurement in inches (Ex: 40 inches). Then measure from the middle base of the neck in back, over the shoulder, and down to the wrist. Larger Sizes: Keep in mind that body shapes differ more dramatically as size increases. For sizes 48 and above, some alteration may be necessary to achieve a perfect fit.